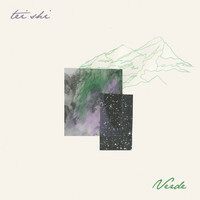 Layering sublime, multi-tracked harmonies over a delicate web of synthetic and acoustic sounds, Valerie "Tei Shi" Teicher is rapidly establishing herself as one of the most exciting emerging talents in Brooklyn. We caught up with the Argentina-born, Colombia-raised songwriter to find out more about her musical upbringing, and to hear the story behind her excellent new EP, Verde. Hi Valerie, can we talk about your musical upbringing please? What’s your earliest musical memory? Well, I have three older sisters, and there is a big age gap between me and the two oldest, so when I was really little they were teenagers. One of them was very into singing and music, so she would always dress me up and encourage me to perform. We had this ritual where every morning we would meet in her room when we woke up, and dance around, singing along to this one song. I have very clear memories of that. So I think she really shaped my love of music and performing. What song did you used to dance to? I wanted to make something more dynamic; I didn't want to be known as this a capella girl. Not really. I mean, all of my family are definitely big music fans, and there was always music being played in my house, and my sisters all have beautiful singing voices, but there are no other musicians in my family. I think my decision to pursue a career in music must have seemed very out of the blue, but at the same time it's something they've all really embraced and supported. Why do you think you gravitated towards music? I gravitated towards music because I started singing songs at a really early age, and that's the thing that I really loved to do. I don’t think I even knew you could make a career out of it, so for a really long time I just sang for myself, in a very private way. But then I discovered that music school was something you could do! So I went to the Berklee School Of Music [in Boston], and started writing more and developing my own sound. What did the course at Berklee entail? You have the ability to study every aspect of a musical education, so I took a big array of courses: everything from theory and arranging to music business and management courses, to film scoring. Does studying a creative art in an academic environment ever cause you to question your natural instincts? I don't really think it ever came into play at all when I was working on my own music. Back then I was very focused on school, but I was working on my songs and writing at home on my laptop too, and I wasn't sharing it with anyone so my music came from a very natural place. I really made a point to create a divide between that academic way of looking at music, and then the way I actually look at my music. I mean, there was a lot to take away from a place like that in terms of learning about the foundations of music, but when it comes to actual creativity it can be very stifling to be trying to learn a formulaic way of creating something. You can end up with a very, very specific idea of what's right and what's not, what's good what's bad, so I really tried to stay away from that. Do you think you've taken anything from that environment? In a sense, I almost think that the music that I'm making is a result of me having defined what kind of music I didn't want to be making. And I learned a lot in terms of understanding music from a more objective standpoint, and learning how to communicate with other musicians - that language. I think the main thing is that a lot of the people who helped me start putting my music out there, and getting my band together, were all people that I connected with at Berklee. Those people definitely shaped what I'm doing now. So tell us more about your new EP, Verde: how long did it take to put together? Some of the songs on there I wrote at the end of 2013, just after I’d released my first EP and others were written closer to a year ago. By this time last year, I had a good amount of songs so I whittled them back down to five and worked on them with Luca [Buccellati] who produces my stuff with me. Then it was a matter of three weeks of re-recording, developing and producing the songs. So yeah, it's definitely been a long process! What was the goal sonically for Verde? I just knew that I wanted every song to be different, and to show a different side of me, but I also wanted it to be cohesive enough that it made sense. Other than that, I just chose the songs that I felt were the strongest and that I felt attached to, and I think they came together really naturally as a result of working on them as a project. Was there anything about the creative process that you deliberately approached differently this time round? Well the first EP was very raw and vocal-centric, and that was just the result of me not having a lot of resources; it was just me and my laptop so production was very minimal and I had to use my voice a lot more to create that aesthetic. This time round, I wanted to make something more dynamic; I didn't want to be known as this a capella girl. (Laughs) So I really worked on incorporating more dynamics, and using more heavy-handed production. Really, I think this EP is the natural result of my learning experiences. What kind of learning experiences? I think some of the initial challenges that I faced were just the result of being prematurely thrown into situations that I wasn't prepared for, and having to learn on my feet. Playing live was a big learning experience for me, because I'd never played my own music in public before. I mean, a lot of musicians play in a bunch of different bands as they grow up, but this is my first musical project. Everything has been a first so there have been frustrations with things not being quick and easy to do. But I’ve learned a lot and I feel like there's been a lot of growth out of these experiences. I'm generally very open to taking on new challenges so I think, as stressful as it may have been at some points, it's been a good thing for me overall. You’re coming over to play some shows in the UK soon, right? Yeah, this will be my first time. I'm really excited! What can we expect from the Tei Shi live experience? What's on the horizon for the rest of 2015? Well, the tour coming up is going to take up a couple of months, and coming out of that I’m really just looking forward to getting back to writing and working on new material. I'm not exactly sure whether that will be for a full-length release, but I hope it will be. I guess I would love to have an album out, and to be playing bigger shows, and reaching more people with my music, and to be getting the chance to collaborate with some amazing artists. But I would like to imagine there are lots of things on the horizon that I can’t imagine too.